"Beware, all ye who enter here! ": this was the last line of my 2014 review of David Muñoz' (b. 1980) three-star restaurant DiverXO in Madrid. 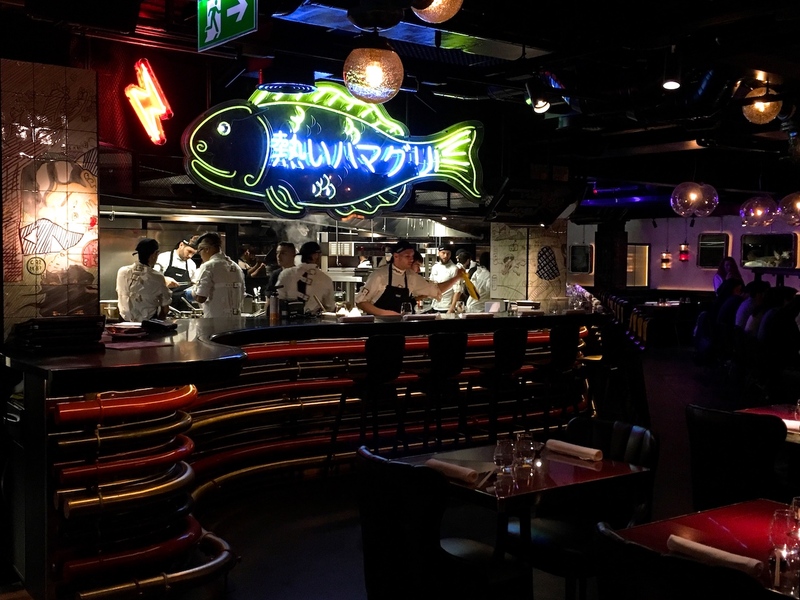 Muñoz is one of the most innovative chefs of recent times, and dining at his funhouse restaurant doesn't leave anybody indifferent. Some experience shock, others experience awe, some experience love and others experience hate. It's like marmite. 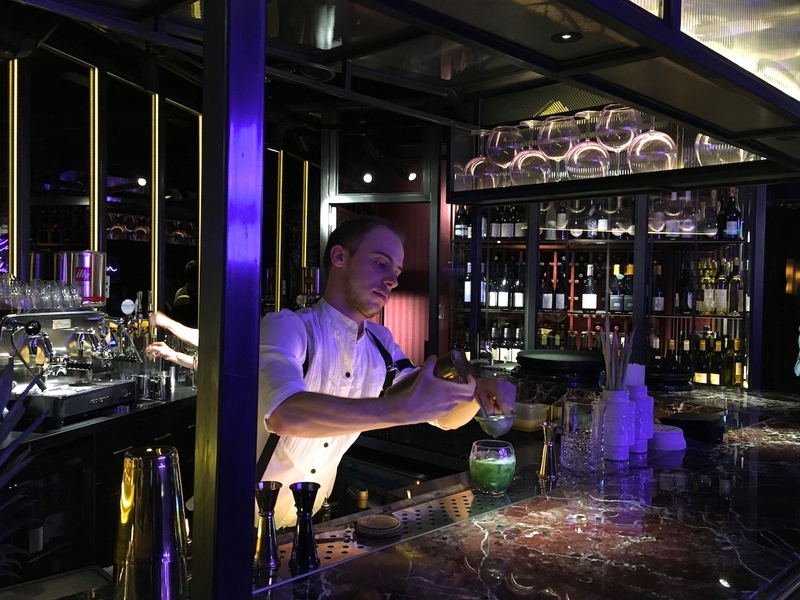 Since my visit in 2014, David Muñoz has moved his flagship restaurant to its present location in the NH Collection Eurobuilding Hotel in Madrid. Also located in Madrid on the top floor of the El Corte Inglés department store since 2012, is the streetfood sibling StreetXO, one of Madrid's most popular restaurants, notorious for long queues at dinner time. 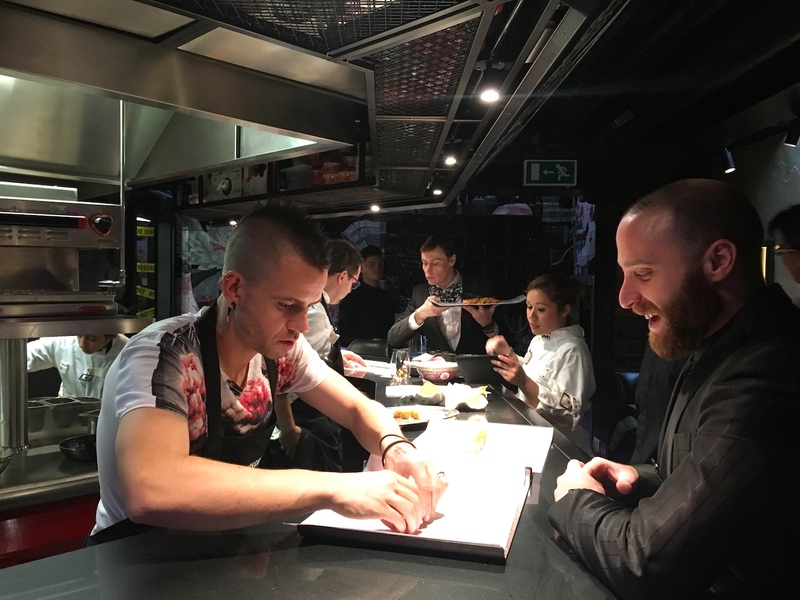 Before opening DiverXO in Madrid, David Muñoz worked at London's critically acclaimed restaurants Nobu and Hakkasan, so it's no surprise that London became his first city of choice to open a second branch of StreetXO. The London branch was originally intended to open in summer 2014, but construction delays meant it did not open until November 2016. StreetXO London ("StreetXO"), a 100-cover restaurant with bar, is located in the basement of 15 Old Burlington Street in Mayfair and the distinctive interior of the restaurant is desighned by Lázaro Ros-Violàn, also responsible for the interior design of the UK's Iberica restaurant chain. StreetXO has a kitchen team of around 30 chefs, lead by David Muñoz (who's in 2 days a week) and his right-hand man Manuel Villalba Martinex. The restaurant is open for lunch and dinner Monday through Saturday. The menu lists a broad range of dishes, which come in all shapes and sizes. Some are bite-sized, e.g. Pekinese dumpling (£14.50 for two pieces) served on Munoz' signature white canvas sheets, or "La Pedroche" croquettes topped with toro tuna (£18.90 for four), but most dishes are small plate/starter size and priced between £11.30 (Zucchini flower salad) and £19.90 (Paella with sea urchin and squid). I had lunch with my husband at StreetXO on Saturday 19 November 2016. I took my decision to have lunch at StreetXO at the very last minute and I made the reservation directly with David Muñoz through Twitter, on the morning before my meal. Once I had been seated, Muñoz asked to be given "carte blanche" that afternoon, to which I happily agreed. On this basis, they served me a very generous amount of food, including some extra dishes which they wanted me to try. They would not charge me for these extra dishes, which came to £68.70 on a total bill of £354.56. Lunch started in StreetXO's glam cocktail bar which offers a "Liquid Cuisine" cocktail list (£11-£14) featuring extraordinary combinations, such as a liquid Tom Kha Kai cocktail with galanga, coriander, kaffir lime, chilli, flying fish roe, straw mushroom and "infinite coconut" or the "XO Blood" with watermelon, bitter almond, citrus and galange, the latter to be drunk from a heart replica (the organ, not the symbol!). 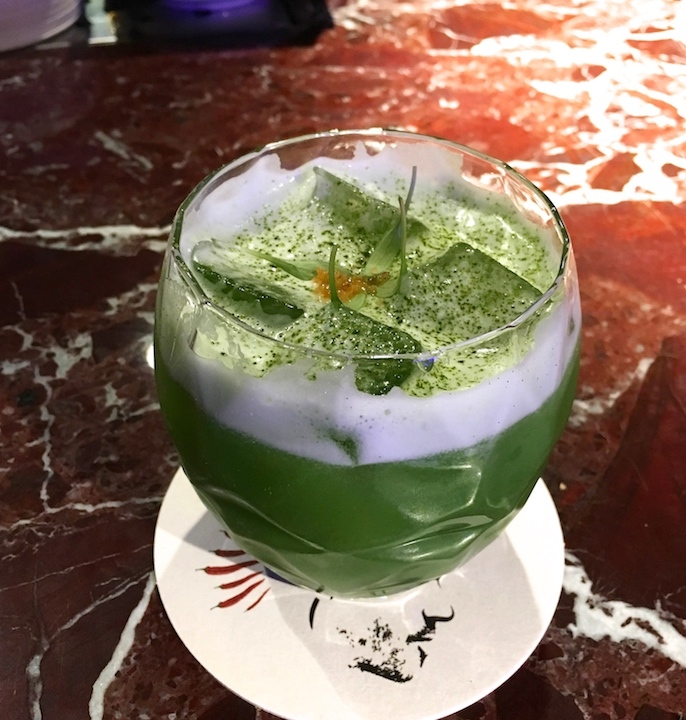 In the end I went for the Matcha & apple Mexican "Tiradito" cocktail with coriander cress, jalapeño, calvados, and worm salt. A delicious creation with subtle smoky flavours, nice fruitiness, some heat in the finish, and wonderfully fragrant coriander. My taste buds were definitely warmed up after this cocktail. Next we taken to our bar seats .... let the games begin! 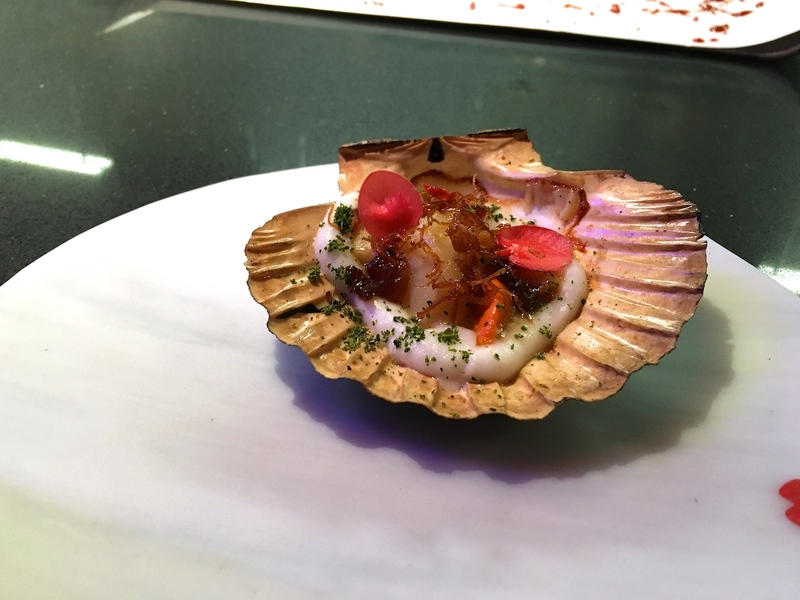 First to arrive was Josper-grilled scallop (flesh & coral), served with ponzu jelly, a creamy coconut sauce/reduction flavoured with kaffir lime, and garnished with crunchy XO sauce, apple blossom, and kaffir lime powder. 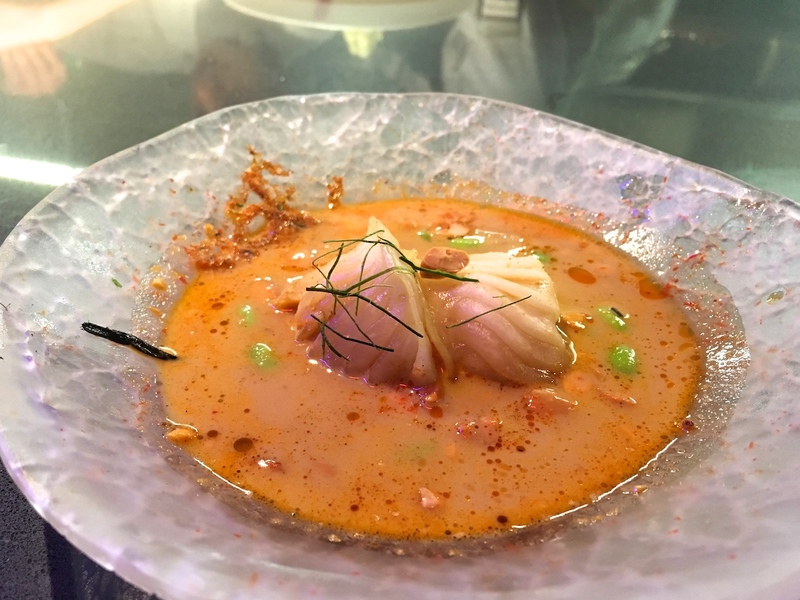 A beautifully balanced dish, the mildly creamy coconut underscoring the sweetness of the scallop wonderfully, but it was the XO sauce and the zingy ponzu sauce which took this dish to the next level. Particularly the crunchy XO sauce gave the dish a nice funky edge. Shortly after, "Pekinise dumplings" were served. 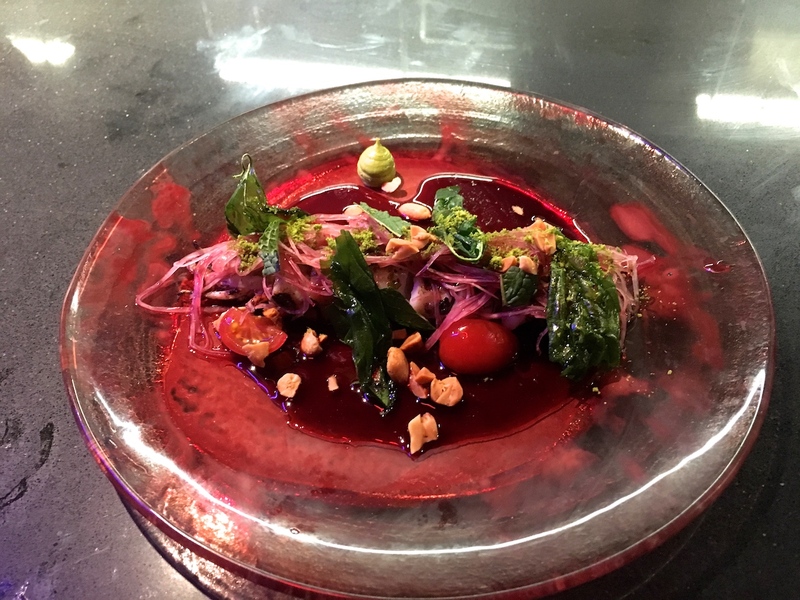 A dramatic dish, of which a more complex version called "Hannibal Lector" used to be served at David Muñoz three-star restaurant DiverXO in Madrid. Today there were two gyoza-style dumplings (one each) topped with some yuzu "ali-oli" (a mayo-like substance), served with a piece of crispy pig's ear, a pickle slice, artistic splashes of strawberry hoisin and a sprinkling of freeze-dried strawberry. Well-executed dumpling, with a wonderfully moist and flavoursome filling and good crisp caramelisation on the casing, resulting in a lovely soft and crunchy texture contrast. 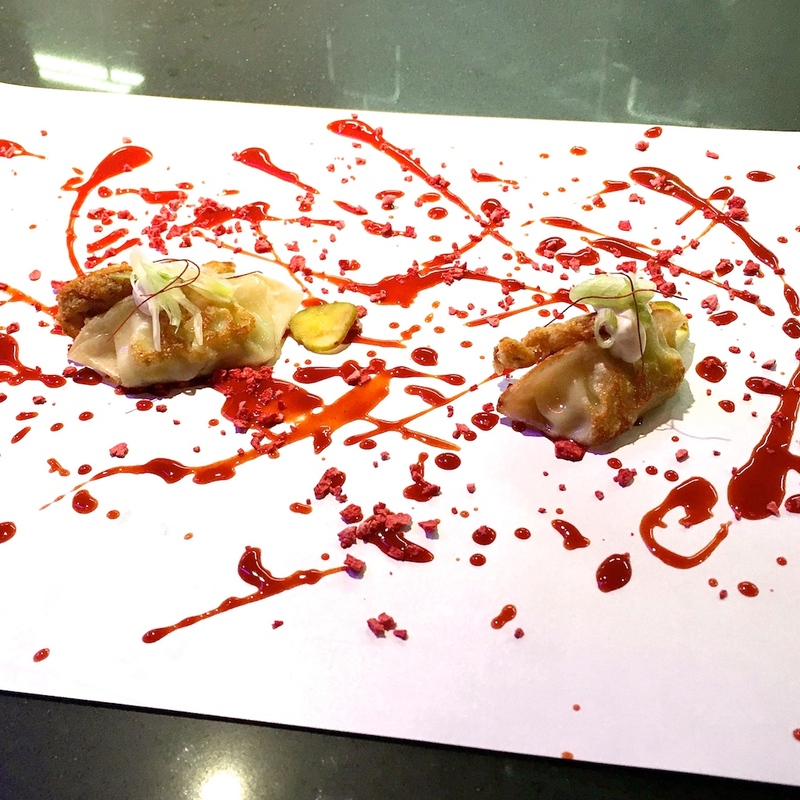 The dumpling was meant to be eaten with your hands, simultaneously mopping up the salty strawberry hoisin sauce. The combination really hit the spot for me, the strawberry hoisin being perfectly balanced. Hoisin is often referred to as Chinese barbecue sauce, and that's exactly what this sauce reminded me of, but in a more fruity version. The dumplings were quickly followed by StreetXO's signature "Steamed Club Sandwich". 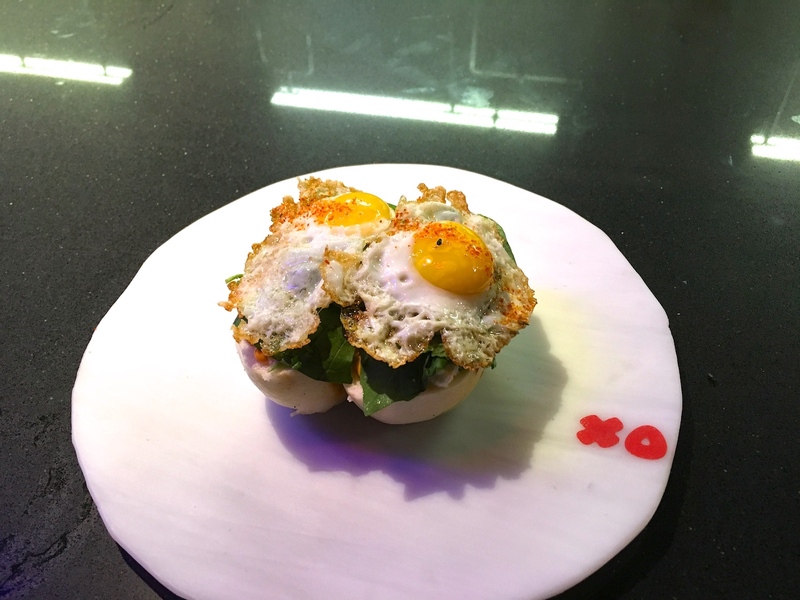 A Chinese steamed bun is cut into half, and each half is then filled with soft and tender suckling pig, followed by a layer of chipotle mayonnaise, a layer of fresh ricotta, some green herbs including mint, and topped with a glistening fried quail's egg. A pleasing combination or textures and flavours, with attractive heat from the chipotle mayo, soothed by the fresh and creamy ricotta, and the egg added a nice touch of richness. Next up was a trilateral Canton, Galicia and Mexico dish (to share): Robata-grilled Galician octopus and squid ink crackers, served with a hallucinogenic tomatillo and green apple mole (which takes two days to make), and "fake Chinese wok noodles", I'm guessing a mixture of enoki mushrooms and stir-fried bean sprouts (?). Rich and meaty octopus, cooked just right, with a wonderfully tender texture and a nice crispy outside, and delicious fake noodles with lovely characteristic soy sauce flavours. 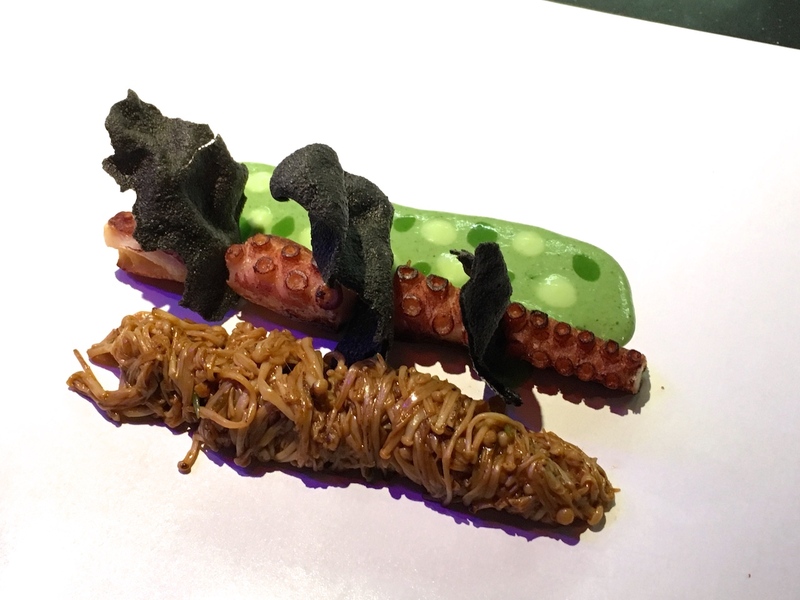 Best of all though, was the green mole which provided a terrific tangy-sweet counterpoint to the rich octopus and noodles. Alongside this we were served a small bowl of "Ramen Hong Kong Madrizzzz", a delightful modern ramen take on the traditional Cocido madrileño. In the bowl was a gorgeous, meaty and mildly spicy broth, a wonton with a soft Iberico pork filling, black trumpet mushrooms, crisp deep-fried taro balls, black garlic, and pieces of soft taro. An outstanding dish with fantastic textures, making every bite a surprise. 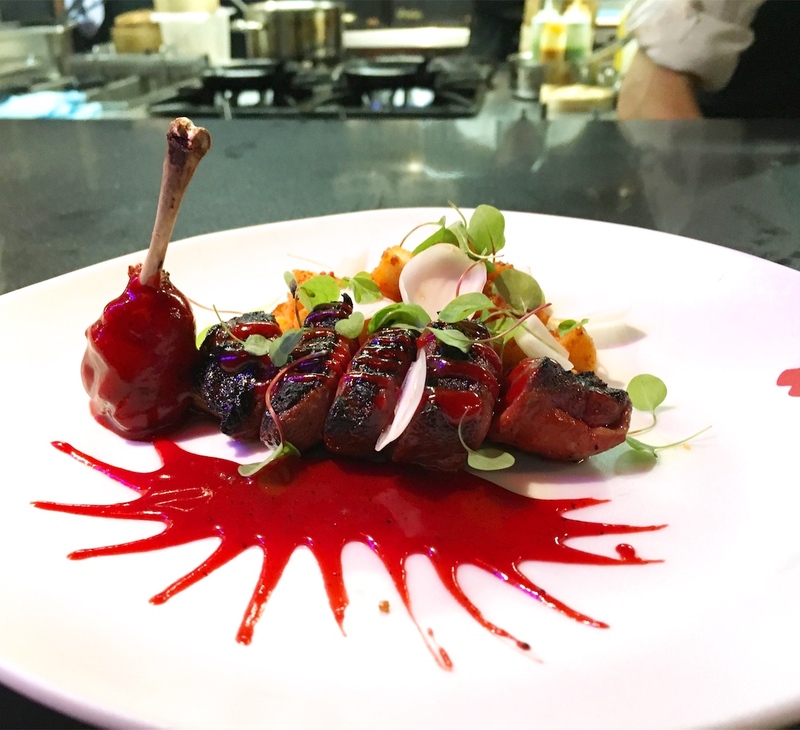 Winner of the day was robata-grilled pigeon (breast and leg, to share) brilliantly paired with a blood-red sweet achiote sauce and StreetXO's take on the traditional Spanish fried bread crumbs' dish "migas manchegas" aka "migas de pastor" and some lily bulb scales. The pigeon used here was a so-called blood pigeon from France. Blood pigeon, also known as pigeon étouffé (the word étouffé not referring to the cooking technique in this context), is a smothered bird, not bled out, resulting in a superb, pure-tasting pigeon that's astonishingly succulent. Loved the combination with the sweet achiote sauce with its lovely mild spicy notes, a true flavour explosion. Equally wonderful was the combination with the "migas manchegas", slightly crunchy bread cubes, evenly seasoned and coloured with chorizo and garlic powder. And finally there were the lily bulbs which brought crunch to the plate and their freshness toned down the richness of the pigeon. 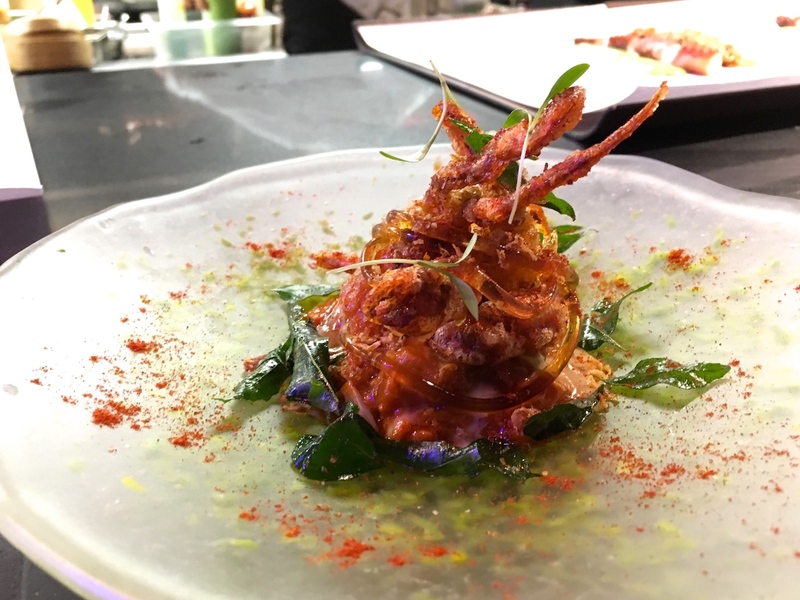 Less convincing was a dish (to share) called "Paris style chili crab": deep-fried softshell crab, intensely flavoured chipotle and paprika sauce, sherry jelly spaghetti, chunks of sherry-marinated king crab, a champagne and butter emulsion/sauce, and deep-fried curry leaves. There was a lot going on on this plate. I couldn't fault the execution (both the softshell and the king crab were well-cooked, the king crab being wonderfully tender), but the chipotle and paprika flavours were very dominant in this dish, and fighting the subtlety of the champagne and butter sauce. At this point of the meal I requested a small break, as my brain was starting to get saturated. I was also wondering if giving a chef like David Muñoz carte blanche had been such a wise idea. The meal continued with two alluring, ruby red carabinero prawns (one each). 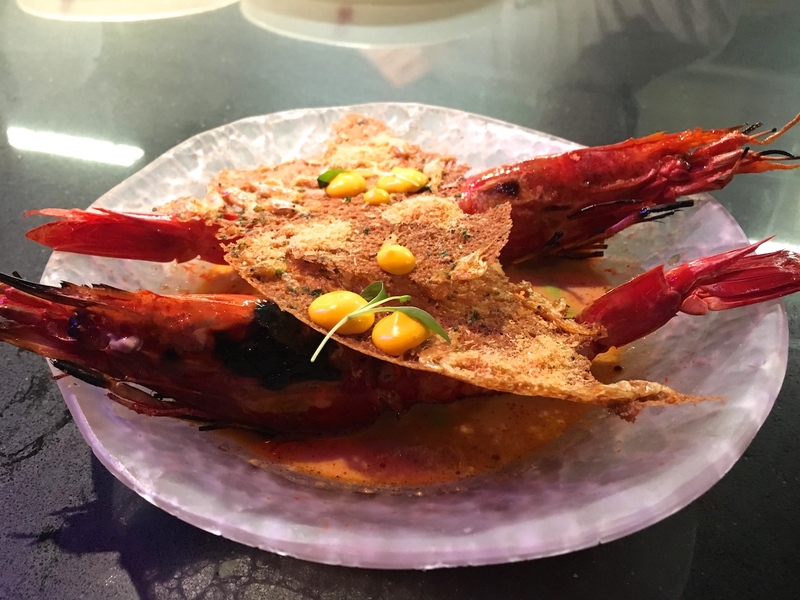 The carabinero prawn, with its robust flavour, is known as the Rolls-Royce of prawns, the head filled with tasty rich juices, and the body meat heavy with its own sweetness. Here they were served with prawn dumplings and "suquet stew" broth, gorgeously seasoned with coconut, peanuts and edamame beans. On top of the prawns was an ultra-thin (almost like lace) and crisp baby prawn cracker topped with little blobs of saffron ali-oli. 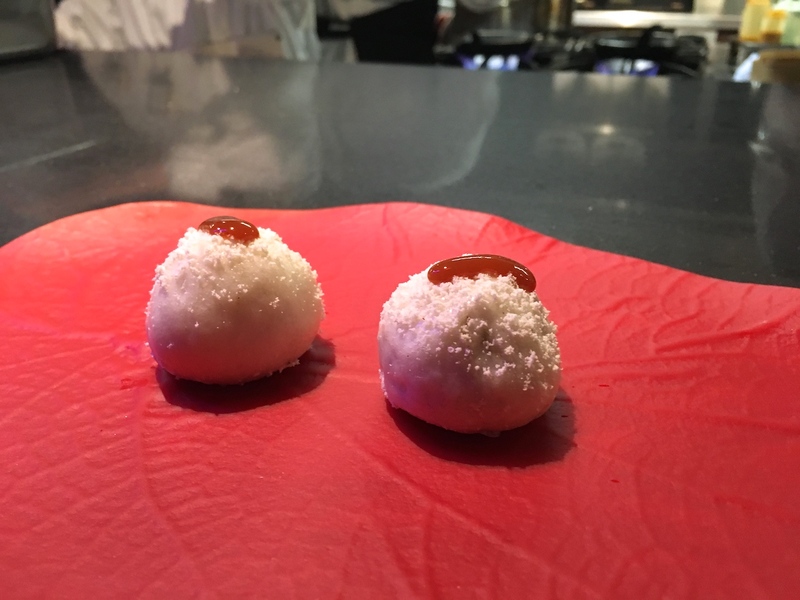 Mini steamed buns with a rapturous filling of sweetcorn, truffle and buffalo milk were served next, quickly followed by a dish (to share) of baby squid and papaya. Beautifully tender and flavoursome robata-grilled squid, topped with herb pesto, and served with sweet yellow papaya (underneath the squid), chopped peanuts, a sharp green papaya salad (on top), deep-fried basil leaves, some basil and lime créme, and finally a sour and spicy hibiscus dressing made with soy sauce, fish sauce, and dried hibiscus. An excellent dish with a great interplay between sweet and sour flavours, the punchy dressing releasing the wonderful robata grilling flavours of the squid. By this time I was almost fit to burst, but there were two more dishes to come. 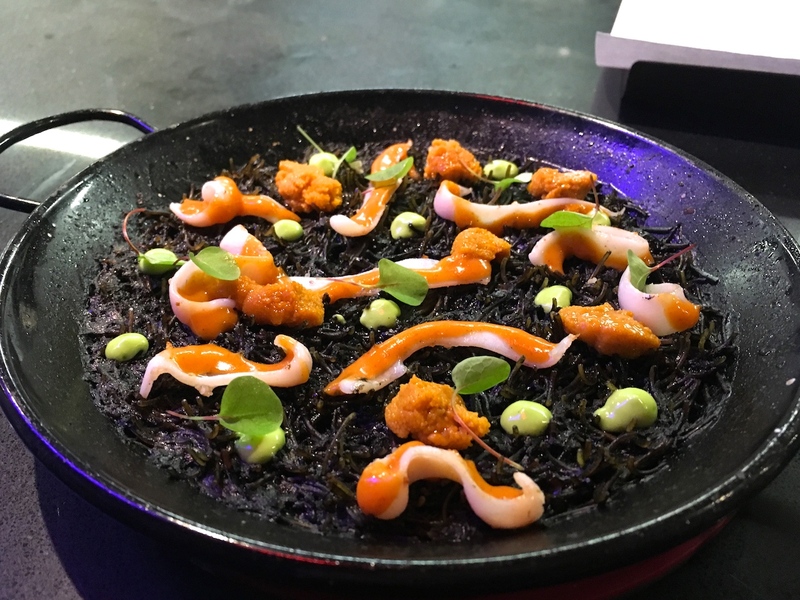 First up was "Paella Rossejat" (to share), a Catalonian style paella with rich squid ink noodles, Hokkaido sea urchin, strips of squid coated with kimchi ali-oli, and dots of fresh herb ali-oli. Expertly cooked paella, including some toasty, slightly burned bits, and a fantastic build-up of flavours and textures. 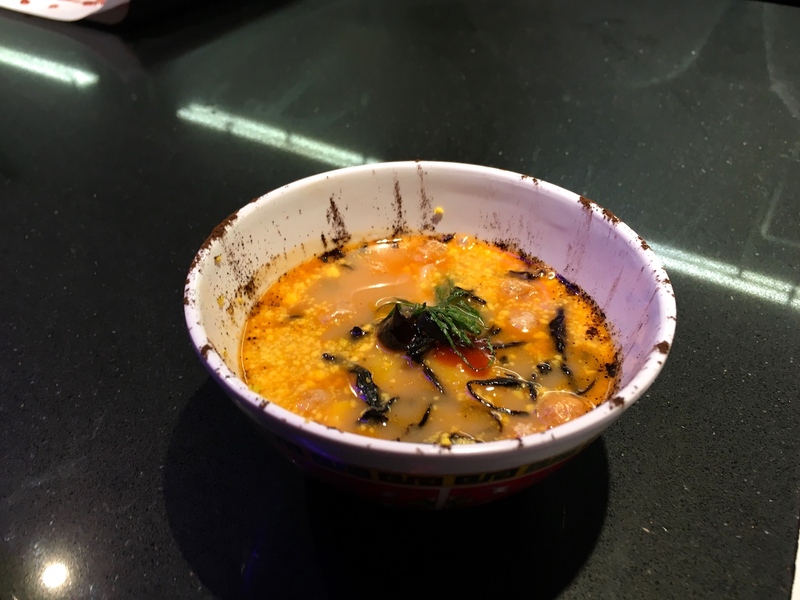 There's the dark complexity of the noodles, a little bite from the squid, some funky spiciness from the kimchi, the opulent and distinctively briny flavour from the sea urchin, and finally some herby freshness from the herb ali-oli. 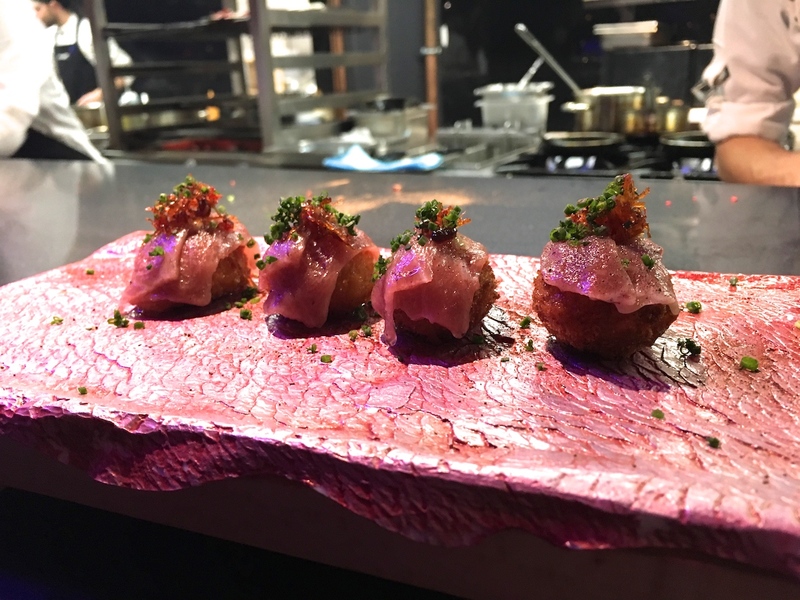 Finally we were served four (two each) "La Pedroche" croquettes, named after David Muñoz girlfriend and actress Christina Pedroche, with a decadently rich filling of sheep's milk and Lapsang Souchong tea, and garnished with toro tuna and XO sauce. Oh, and there was some sort of Pink Panter dessert dessert/drink in the end. 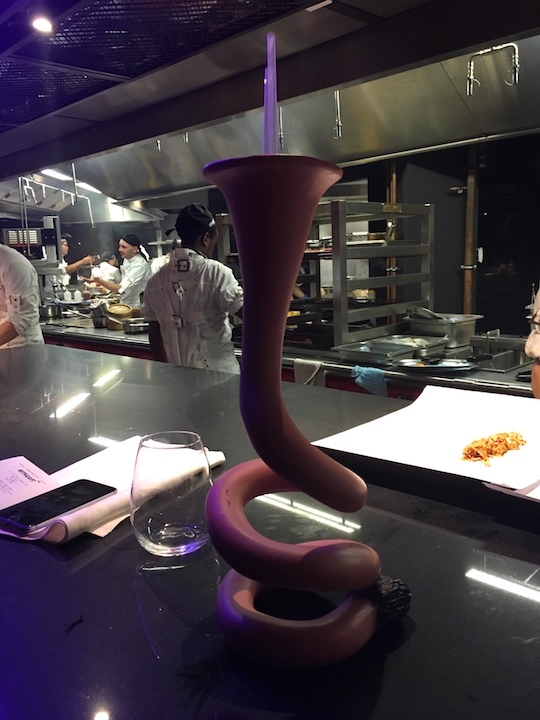 If you are not used to the style of David Muñoz, visiting StreetXO in London is likely to be an almost surreal experience. If Salvador Dalí (for whom food was such an important inspiration for his art) had ever designed a restaurant, I might have looked a lot like this. Watching staff wearing corsets and (what looks like) straitjackets adds to the sense of bewilderment in this dark and noisy basement, until you realise that the name of the restaurant can also be pronounced as 'Strictso". And just when you wonder whether you have entered a restaurant or a haunted house, you start to realise that the food from this punk chef with his Mohican hairdo is not a motley collection of ingredients randomly assembled on a plate, but a deeply authentic, modern interpretation of the culinary heritage of Spain, including its former American colonies, brilliantly laced with Asian influences. The overall experience is quite overwhelming and especially the loud music (probably louder still in the evenings) sometimes makes it difficult to savour the more subtle flavours on the plate in front of you. Muñoz told me StreetXO in London is a polished version of StreetXO in Madrid - I can hardly imagine a more intense experience, but it seems a rougher version is available in Iberia for the intrepid. As always however, this review is about the food, not about the crowd, not about the lighting, not about the music, not about the decor, not about the handwash in the toilets. If we strip away all this "noise", and if we imagine (for argument's sake) eating StreetXO's food in the serene circumstances of a laboratory, what would the verdict be? What is the quality of the ingredients? How does the food rate, in terms of creativity, complexity, innovation and finesse? These are challenging flavours, making for a gustatory experience that is unique in London, an outstanding and very individualistic cuisine, delivered by an extremely passionate team, who understand that full-on dishes like these can only shine if they are executed to perfection. The sometimes frantic energy in the kitchen was palatable and Muñoz was very much a part of it. He is not a chef who just plays with his iPhone at the pass or spends his time fraternising with his guests - he likes to cook and that is what he does. StreetXO occupies a unique place on the London dining scene and the capital is fortunate to have it.